Nepal beat Bangladesh 2-0 in a group match of SAFF Suzuki Cup football tournament in Bangabandhu National Stadium, Dhaka on Saturday (Sep 8) to book a place in the semifinals. Despite being a comfortable position in the points table, the host failed to reach the next round. It was also superb football display by the Nepalese booters who played organised football although, especially in the second half, and after the first goal Nepal did not allow Bangladesh to come back in the match despite their repeated attempts. After the day’s win, Nepal moved to the semifinals as group A champions with six points from three matches. Bangladesh and Pakistan also have six points, but Pakistan finished group runners-up having better goal difference. 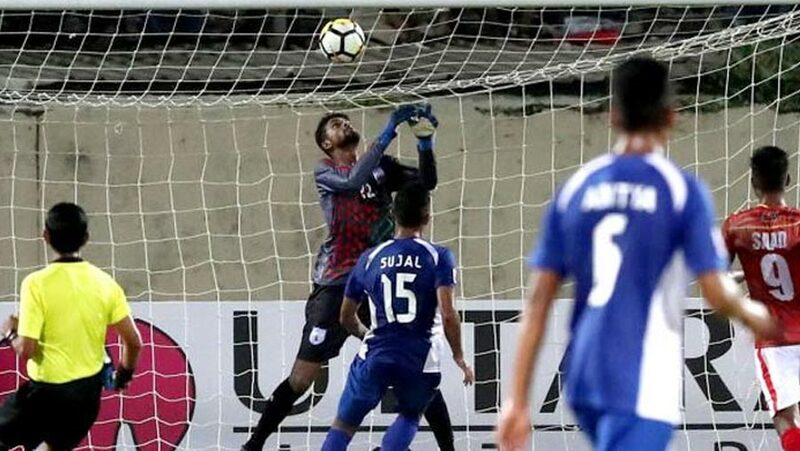 On Saturday, Bimal Gharti Magar gave Nepal a surprising lead in the 33rd minute when a long range free kick found the net after Bangladesh custodian Sahidul Alam failed to grip the ball in his second attempt from the goal line. Nepal again came close to home in the 37th minute when Sujal Shrestha header from the centre of the box off Sunil Bal cross was high and wide to the left. In the 42nd minute, an effort by Tutul Badshah and Mamunul Islam from outside the box was saved by the Nepal custodian. Nepal again launched attack in the 54th minute when skipper Bharat Khawas powerful left footed angular shot from the right side of the box was fisted by Bangladesh custodian Shahidul. Nawayug Shrestha sealed the victory for Nepal scoring the second goal in the 90th minute. Taking a short pass from Bishal Rai, he sent the ball to home from the centre of the box silencing the crowds. Nepal played dominating football in the proceeding especially in the second half, and notched their deserving victory while Bangladesh failed to utilize the opportunities lack of proper finishing. Earlier, Bangladesh beat Bhutan 2-0 in their tournament opening match and edged past Pakistan by 1-0 goal in their second group match. On the other hand, Nepal, despite losing 1-2 goals defeat to Pakistan in their tournament opening match, found their rhythm with their 4-0 thrashing against Bhutan. Sunday’s match: India vs Maldives 7 p.m.